What’s so tempting about granola, and why might it not be the healthiest snack? For starters, it tastes like candy! Looking at the label, it’s easy to see why. Granola is chock full of honey (sugar), brown sugar (sugar), crisp rice (starch), dried fruit (sugar), oats (starch) and canola oil (fat). 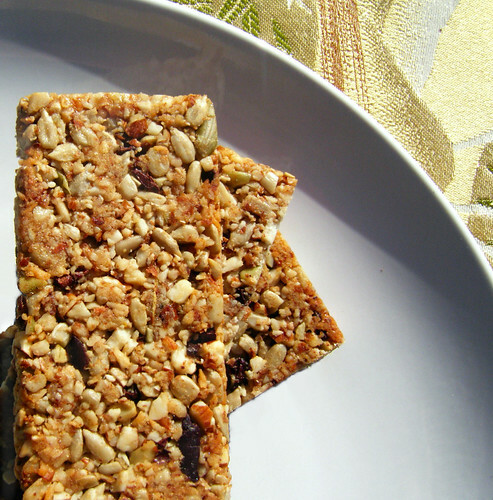 Granola bars are carbs, carbs, and more carbs, glued together with processed fat. Sounds like a recipe for a high-GI junk food, doesn’t it? And yet, granola bars are touted as “all natural” and full of “whole grains,” so we feel less guilty reaching for one of these innocent treats versus a candy bar. Interestingly enough, per gram, a Snickers bar has 3 less grams of sugar than those Nature Valley granola bars in the vending machines! At least the Snickers has peanuts and cocoa butter, for some protein and healthful saturated fat. While neither of these are great snack choices, it makes you think, doesn’t it? Oats (certified gluten-free, if you’re gluten intolerant) are not inherently unhealthy. I even use a little oat flour in low carb pancakes and pie crust for structure and chew. It’s just that eating a whole bowl of oatmeal for breakfast might not be the best for weight loss, unless you’re going for a morning run. The granola bars you see below and at the top of this post are made from nuts, seeds, and other wholesome ingredients. This recipe is super flexible. Just use what you have on hand! You could make these paleo friendly by nixing the xylitol, and adding a bit more honey. Most importantly, they won’t give you that fat-storing blood sugar surge. And yes, they still taste like candy. A little chewy and a little crunchy, these bars taste just as good as the store bought kind. Use a small to medium sized food processor for this. Add almonds and pecans to processor bowl, and pulse 8-10 times. You don’t want any large chunks visible. Add sunflower seeds, pepitas, coconut, cacao nibs, flax seed meal, coconut milk powder, xanthan gum, sea salt, and stevia. Replace lid, and pulse 3-5x, until pepitas have been chopped up a bit. Preheat oven to 350 degrees Fahrenheit (300 for convection ovens). Line the bottom of a 8 by 4″ loaf pan with a rectangle of parchment paper. Heat honey and xylitol in a small saucepan over medium heat until you see tiny bubbles forming in the honey mixture. It usually only takes a minute or two for the xylitol to dissolve. Wait one minute after xylitol has dissolved, then take honey mixture off heat and stir in vanilla with your silicone spatula. Quickly, scrape hot liquid from pan into dry mixture, and stir around vigorously with spatula until mixture is evenly coated. Press mixture evenly into the bottom of loaf pan with spatula. Bake for 10 minutes (7 minutes, 30 seconds in convection ovens). Remove bars from oven, let cool a couple minutes, and invert slab carefully on to cutting board. Cut into four pieces (across, and then across once more) with a sharp knife. Remold the corners as necessary if a few crumbs break off. Slide bars, bottom side up, on to metal pan. Bake for 9 more minutes (7 minutes for convection oven). Remove from oven, and place bars on cooling rack. Store in zip top bags in the refrigerator. Once the bars are completely cooled, they’ll hold together nicely. It feels so good to be finished with college! I having been baking up a storm, getting back into my creative cooking groove. Stay tuned for a barrage of summer treats comin’ at ya. Your requests have been very helpful in steering me towards new recipes to make over! Some informational “FAQ” posts requested by readers concerning sugar-free sweeteners (erythritol, xylitol and stevia, yay!) are also in the works. I have a question for y’all, concerning Twitter – How do you use Twitter for in your daily life (or for healthy cooking chatter)? Are you part of the craze? Let me know in the comments! If you do nothing else, you've already left a mark on the world with this blog. Congrats! Congrats on your graduation! Your recipes are awesome! Exciting to have a good granola bar recipe. Thank you! We already made grain-free granola cereal, but I didn't know how to translate into bars. Will definitely bookmark and try. Congrats Lauren! This recipe looks great! I have truly appreciated your blog. Going very low carb has changed my life and your blog has been a huge cheerleader for me! Your gooey pumpkin butter cake is my husband's favorite. I make it as muffins and he has one every day as a snack after lunch! I made the carrot bites as minis yesterday and thought they were very good! Thank you again for your innovative ideas! I too make a grain-free granola, but have never made it into a granola bar. This sounds really good! Re: Twitter — I don't use it. Addy – It's wonderful to hear you've had such a change in your eating! I'm so happy you took the "leap of faith" and bought these funky ingredients to make my recipe. 😀 Thanks for the kind words! Alissa, glad these recipes are giving you your low carb sweet fix! 44socks – I'm off to check out YOUR granola recipe. It's so cool to see how others make it. Lisa – That pumpkin cake is good stuff – thanks for reminding me to make some. Happy your husband likes it! Hope the ice cream turns out well! 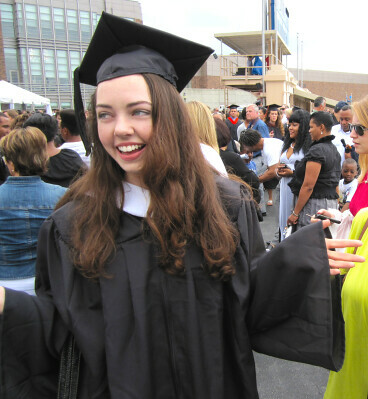 Congrats on your graduation, Lauren! 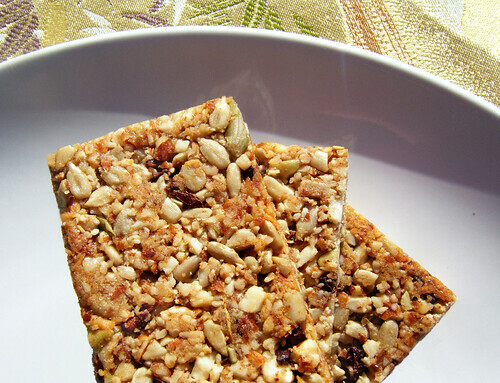 I can't wait to try making these granola bars! I LOVE the Coconut Flour Pound Cake and I'm looking forward to more of your amazing recipes!!! I just found your blog via the Paleo Digest. Nice job! Do you think I could use a little stevia in place of the xylitol? I have it on hand! Thanks and congrats on your graduation. Caveman – Thanks for stopping by! Anon – Hmm, you might not want to increase the stevia if you think it will taste bitter. Feel free to experiment a bit with it – it only makes a small batch, so you won't waste much in terms of ingredients. Kaffee – Thank you for the advice re: Twitter! It's fun to be a part of it. See you on there! i think i'm in love. i am SO making these tomorrow! Congratulations!!! Love this recipe, I have all the ingredients to make this am except coconut milk powder. I'm going to sub nonfat dry milk, I guess due to my lack of patience!!! Thanks for the great recipes which help me stay lower carb! I use twitter, but not as religiously as, say, FB. It's a fun quick way to post pics and check out all sorts of topics. Congrats on your graduation! Your recipes are fabulous! These are absolutely delicious!!! I didnt' have coconut powder, though, so I subbed nonfat dry milk. I think this is why mine didn't stick together. It still made a great granola. Anyway, as far as Twitter goes, I follow people – will follow you! Yay! – for dietary and health support – and check it while waiting for other things, kind of like I use Facebook. I wonder what they taste without the stevia. What a delicious healthy recipe!! I love that there is no sugar in them! You look radiant as always, Lauren. Congratulations! Please keep an eye open for an important email from me. I attempted the granola bars and doubled the recipe. The granola is good but mine crumbled in each stage. Any suggestions? Kim, I'll make them again – they held together well after they cooled fully for me. I did have to remold the corners after I carefully flipped them for the second baking. Will report back! Lauren, What can you substitute for honey? I stay away from sugar COMPLETELY so I don't want even natural sugar. they did not hold the bar shape well and eventually broke into large chunks which is perfectly fine with me. even my husband who prefers a SAD loved them. these will now be a staple in our home. thanks lauren for another great recipe. you never fail to disappoint. looking forward to your revised "oatmeal." Kate – Hi, Kate! The granola would work well with a tablespoon of erythritol. It wouldn't stick together like bars, though. Hope that helps! I've been searching forever for a low-carb granola bar recipe, and now I've finally got one. Thanks Lauren, and keep up the healthy recipes. I love your website, and look forward to what's next. VERY excited to try these! im considering adding a few sugar free chocolate chips;) chocolate chip granola bars were a big weakness of mine before going low carb;) these sound amazing!! Xylitol, water, honey flavor, xanthan gum, citric acid, sorbic acid, caramel coloring. Thank you for all that you have done to change my life! Hello, Judy! Are the current xylitol-based sugar-free honeys being sold by companies very thick, like real honey? I was just wondering whether it is possible to come close to the thick and sticky consistency of the real thing! These are great! I quadrupled the recipe to share with family. I used a large cookie sheet with parchment paper. After cooking the first side & cooled a few minutes, I flipped it onto an even larger cookie sheet so it was kept intact. After cooling, they stayed intact. Very tasty & easy to make! I have more in the oven now. I'm going to try freezing some this time. Honey isn't good for those of us with glucose intolerance or diabetes. Just a little will send my blood sugar soaring and make me light-headed. I use Honey Tree's Sugar Free Honey instead. It's great! You can hardly tell the difference. I think I picked up my first bottle at Walmart. Well I tried two times and these bars just refuse to stay together for me. But they make a very tasty snack mix, the non-low carbing DH refers to it as bird mix but he still managed to eat it most of it before I did. Thanks for the recipe Lauren. I need some good baking bread to make sandwiches or panini that is low in carb for a diabetic. any suggestions? The breads I have tried buying at the stores and online are horrible tasting:( I love your recipes they are amazing!! I substituted erythritol for the xylitol and pumpkin seeds for pepitas and didn’t have any coconut milk powder. Mine didn’t stick as bars but made a verrrry yummy granola! Thanks for the recipe! would these still stick together and come out right? im just worried they wont stick together if i skip all of this… if not do you know any substitues for gum and milk powder? Hmm, if you mix a couple of tablespoons of honey with a couple of tablespoons of peanut butter, you should be able to get the bars to stick together without the sweeteners you listed. Using no sweetener it’ll be pretty tough to stick the granola together. Hope that helps! They didn’t stick together at all and personally just looking at the recipe, how can 1 tsp of honey hold an entire recipe? So after it cooled and was still a crumbly mess, I added 2 large pats of butter and 1/4 cup of agave. Rebaked for 12 mins more and NOW they stick. Thank you for the recipe.